Lahore – wow what a city on earth. There is a Persian saying that if there was no Lahore, Isphahan (Iran) would have been half of the world. There is yet another ancient proverb, "Even if Persia's Shiraz and Isphahan were united, they wouldn't make one Lahore." Lahore vividly resides in my memory as it was here that a five year old lad was reared and brought up to grow up into a young man of 20 before he left for Abbottabad to explore the breadth and length of Pakistan in days to come. But first let us talk of Lahore. Lahore, or Laha-war, Laha-noor, Loh-pur, Mahmood-pur or Lohar-pur, has existed even in 1000 BC, when it was founded by Prince Loh, son of Rama Chandra. In 630 AD, the city was visited by Hieun Tsang, who remarked it as a Great Brahman City. However Lahore rose to its glory in the times of the Mughal empire and thereafter when many a landmark appeared on its landscape. In 1021 AD, Mahmood Ghaznavi Captured Lahore. From 1186-1206, Shahab-ud-Din Ghauri conquered and reigned Lahore and brought it under the Ghorid Empire. In between 1241-1310, the Mongols ransacked Lahore many a time, while Tamerlane plundered Lahore in 1398. In 1524 Zaheer ud Din Babur, the first Mughal emperor captured Lahore (painting on left) and hence founded the Mughal empire which lasted till 1857, when British took over the entire Indian Sub-Continent. Lahore rose to its peak of glory in the reign of Mughal emperor Akbar, who made it his capital and held his court In Lahore for 14 years from 1584 to 1598, and built the Lahore Fort, as well as the city walls which had 12 gates. Some of these still survive. His son, Jahangir, is buried in its outskirts. Close by is the mausoleum of the famous Mogul Empress, Noor Jahan, who is known for introducing the rose plant and for initiating several cultural movements in the Sub-Continent. The last great Mogul emperor, Aurangzeb (1838 - 1707) built Lahore's most famous monument, the great Badshahi Mosque. At that time the river Ravi, which now lies a few miles away from Lahore, touched the ramparts of the Fort and the Mosque. "Agar Firdaus bar rue Zamin ast, Hamin asto Hamin asto Hamin ast"
"If there is a paradise on earth, This is it, This is it, This is it." Lahore used to be a fortified city of twelve massive gates, whose names have outlived the largely pillaged walls. It has been a great city for at least a thousand years, but not when it was conquered, manhandled, occupied and ransacked by the Sikhs when they took advantage of the Mogul decline in the eighteenth century to seize the Punjab in 1764. During the Sikh's rile, Lahore was ruthlessly robbed of its beauty and all precious stones and artifacts from the Mughal buildings were plundered and taken to Amritsar for the construction of the Golden Temple. The British annexed it into the British hold in 1849 and transferred to the British Empire in 1857. Lahore played an important role in the Pakistan movement and the passing of the famous Pakistan Resolution on 23 March 1940 at Manto Park (now renamed as Iqbal Park) nest to the Badshahi Mosque and the Lahore Fort makes it more historic. 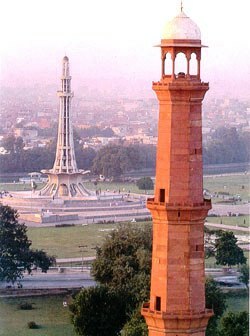 The towering Minar-e-Pakistan reminds the historic event to all those entering Lahore from the north. Lahore is a city of its own kind – rich in culture, heritage and history. It is conglomerate of pre-Mughal, Mughal, Victorian and modern architecture and relics that abound it in its various parts. It may not be wrong to say that Lahore is the "Show-Window" of the pre-Muslim era, erstwhile Mughal and British Empires, besides a modern fast developing city. The majestic Badshahi Mosque, Masjid Wazir Khan, Lahore Fort, the Shalamar Gardens, the tombs of Noor Jahan and Jahangir, the Zamzamma gun (better known as “Bhangion ki Toupe” or the Kim’s Gun after famous British storey teller Rud Yard Kiplings who defied the then British law of sitting by the gun and wrote short stories) are some of the historic sites and objects worth visiting and admiring. That is it for the history of Lahore and its place in the yester years. My next post will be my account of Lahore as I saw it through my childhood and as a young man, about Lahorites and their many qualities that make them different, hearty, fun loving and very very hospitable. Reminds me of our college days - I will soon write a post on our GC days and I will also share a photo that shows you, Arif and Hameed (taken on wedding of Arif's daughter).